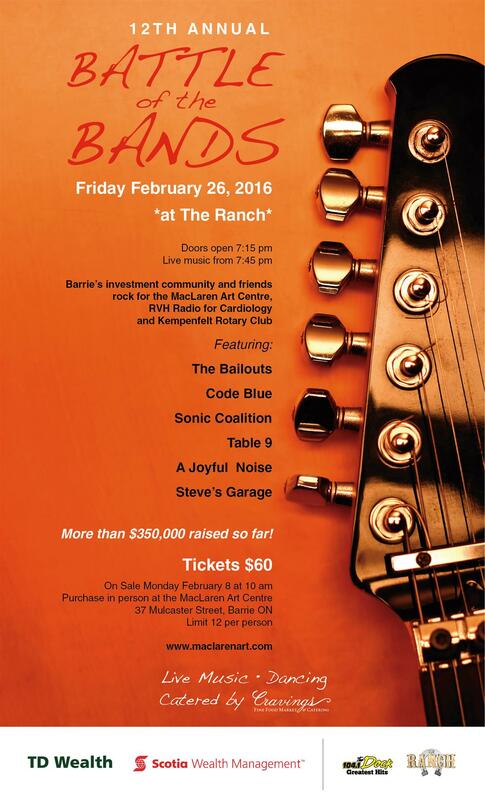 The Ranch was rockin' and rollin' February 22 with the 15th annual Battle of the Bands. The Bailouts, Bunker, Code Blue, Sonic Coalition, Steve's Garage, and Table Nine, put on a great show to earn bragging rights. 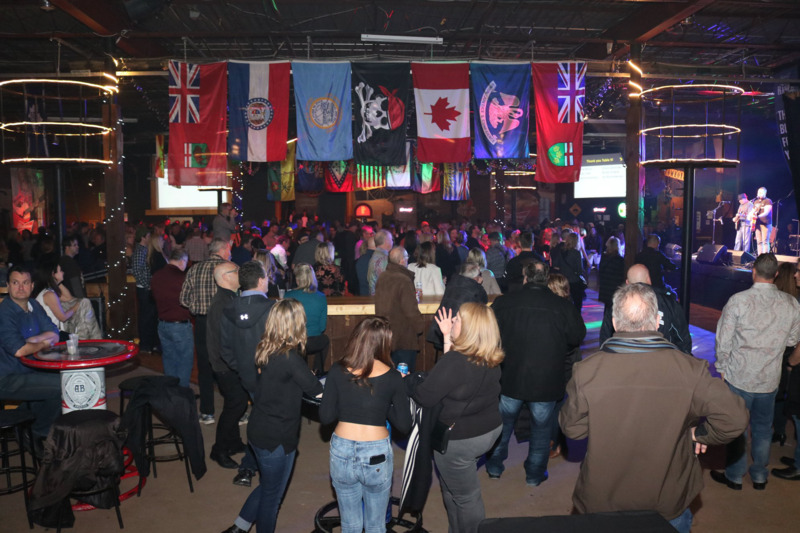 Proceeds from the evening will go to support KICX 106 & 104.1 The DOCK's Radio for Cardiology, Kempenfelt Rotary Club and, event organizer, the MacLaren Art Centre. 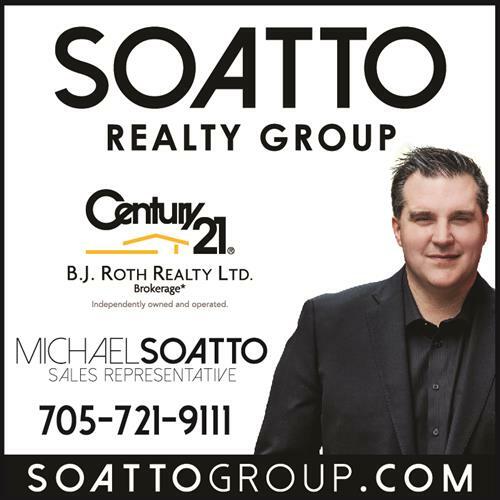 Thanks go to TD Wealth, Scotia Wealth Management, Grant Thornton, J.P. Wiser's, 104.1 The DOCK and The Ranch for their generous sponsorship. What a night, full of fellowship, fun and great music. Thanks to everyone who made it out! Congratulations to Steve’s Garage, this year's Battle winner! 2018-2019 school year. Families in Dekpor, Ghana are faced with the impossible decision of having to try to provide enough food for their children or giving them an education. The truth is, without the food programme, the neediest wouldn’t attend school. Some days kids are sent to school with a handful of peanuts, and other days with nothing at all. When extreme hunger is constantly present, it’s impossible to concentrate on lessons. Dekpor School Development Organisation has been able to put these students on the food programme for the rest of this school year, which means they will receive a nutritious breakfast and lunch every school day. Not only that, but they will also receive any required medical attention and also have their summer school fees covered. 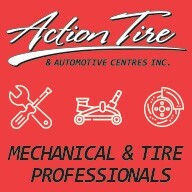 You can follow them on Facebook and check out their website. 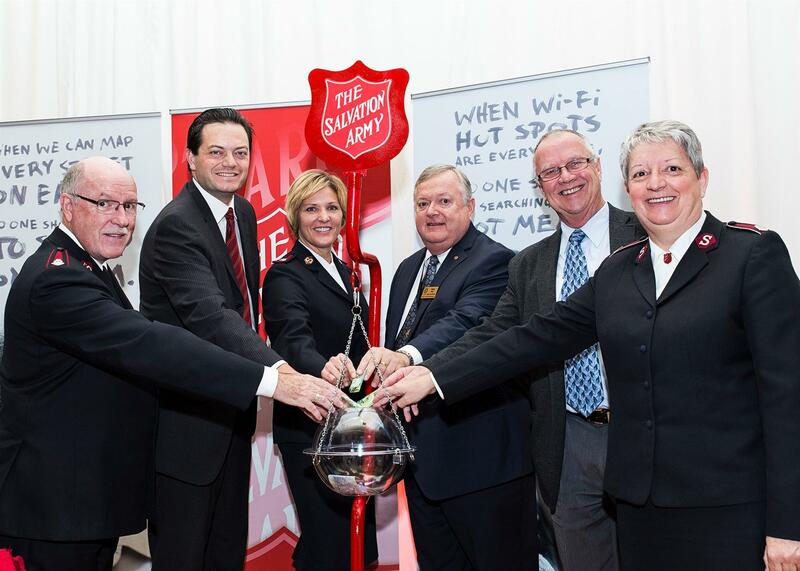 Every year, the Kempenfelt Rotary Club volunteers to staff a Salvation Army Kettle for a day. This year, we covered Kettle duty on Dec. 8 at the Beer Store on Bayfield Street, just north of the Georgian Mall. Volunteers spread good cheer, jingled their bells and collected donations from 10 a.m. to 9 p.m. Feele good to support the Salvation Army and help raise funds that go to helping folks in the Barrie community during the Holiday Season. New Rotarians in the Rotary Club of Barrie Kempenfelt made a donation, on behalf of the club, to the Youth Holiday Dinner at the Horsepower Grill put on by Simcoe Muskoka Family Connexions. The dinner provides a holiday meal, gifts, fellowship and festivity for young people in need over the holiday season. Thanks go to the new Rotarians for choosing this event to support and experiencing the best thing about Rotary -- giving back! 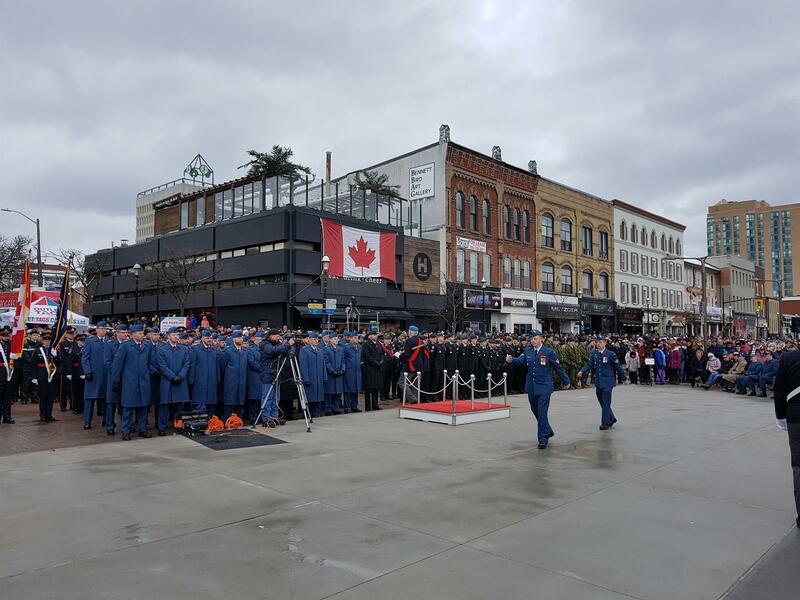 was observed at 11 o’clock Sunday morning to honour the courage and sacrifice of those heroes. 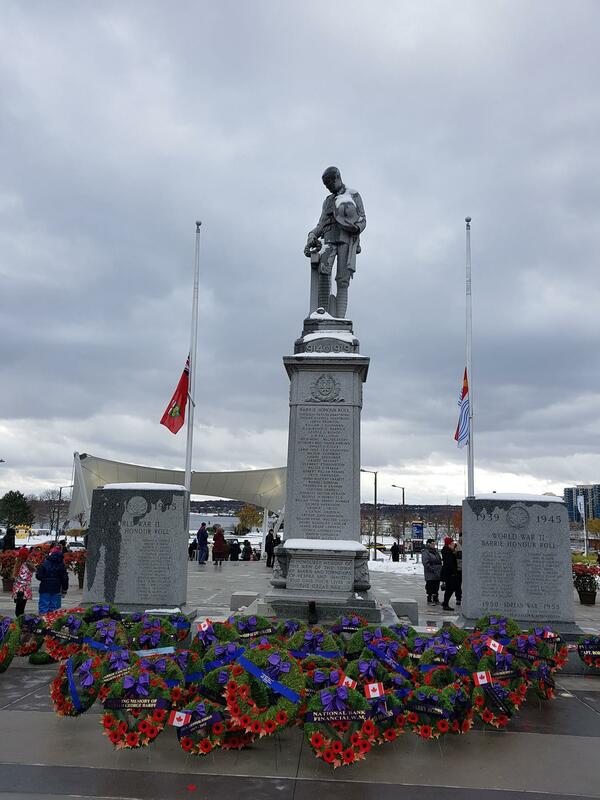 This year marked the 100th anniversary of Armistice Day. In 1918 on the 11th day of the 11th month at 11 a.m., an agreement was signed between the Allies of WWI and Germany to end hostilities. World Polio Day was established by Rotary International over a decade ago to commemorate the birth of Jonas Salk, who led the first team to develop a vaccine against poliomyelitis. 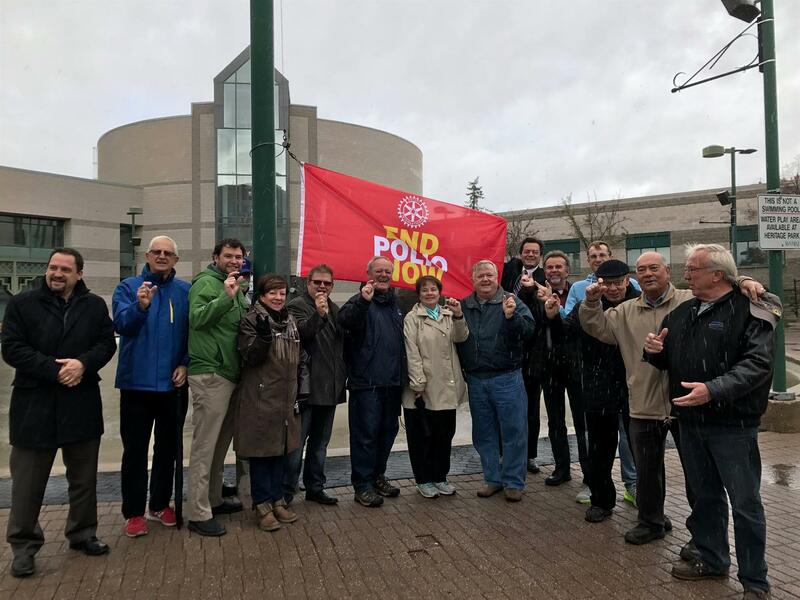 In Barrie the day started with members of Barrie's three Rotary Clubs, Mayor Jeff Lehman, and local dignitary representatives gathered at City Hall for the Polio Day Flag raising and ended with a Tri Club Polio Walk from Centennial Beach ending at Hooligans for some fellowship. Even the newest members of our Rotary family attended to help raise awareness. Rotary, along with our partners, has reduced polio cases by 99.9 percent worldwide since our first project to vaccinate children in the Philippines in 1979 and we won't stop until we end the disease for good. 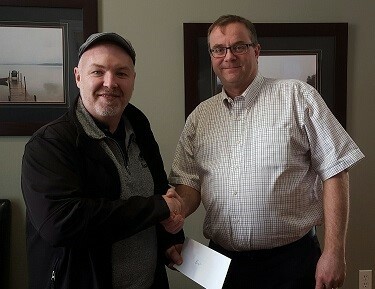 In this picture Michael Smiley from Kempenfelt Rotary is presenting a $1,000 donation to Jamie Hall for the Simcoe Community Services. Jamie Hall was our guest speaker giving more information about Simcoe Community Services. Founded in1953 and supports people with intellectual disabilities. The alternative at this time was institutionalization. It is all about inclusion in society. They provide services for children and adults with intellectual disabilities and their families. 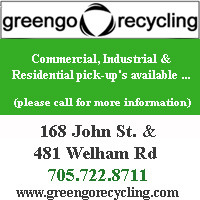 They have over 550 employees in the Barrie and Orillia area. Our recent donation of $1,650 to the Dekpor School Development Organization (Ghana) will feed 10 children a healthy breakfast and lunch for a whole school year. In this picture is Michael Smiley presenting our cheque to Carol Sheardown from DSDO. Proud to be Rotarians making a difference! A Leadership breakfast with The Salvation Army. Annual Fundraiser and Launch of the Christmas Kettle Campaign. There are also various sponsorship packages available. In picture from left to right: President Monique Vaillancourt, Bill Fligg, Steve Lee-Young, Jane Decola,Michael Smiley. At very right, Past President George Dangerfield. 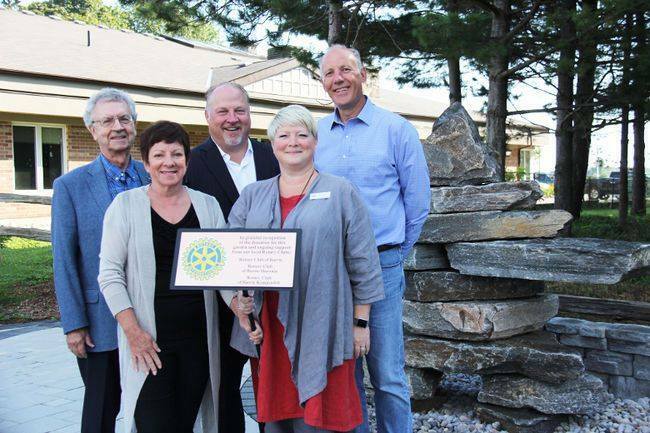 A plaque was recently placed in the new garden at Official Hospice Simcoeto thank the three Rotary District 7010 Clubs for their commitment of $24,000 each towards Hospice's Hummingbird Campaign. The funds were utilized to purchased land for the creation of a new parking lot and garden space for Hospice Simcoe. From left are Alf Dyck from the Rotary Club of Barrie Huronia; Monique Vaillancourt, president of Rotary Club of Barrie Kempenfelt; Joe Beleskey, president of the Rotary Club of Barrie Huronia; Kelly Hubbard, executive director at Official Hospice Simcoe; and David McCullough, president ofRotary Club of Barrie. If you are a visiting Rotarian, Rotaractor or guest of a member, we look forward to seeing you! 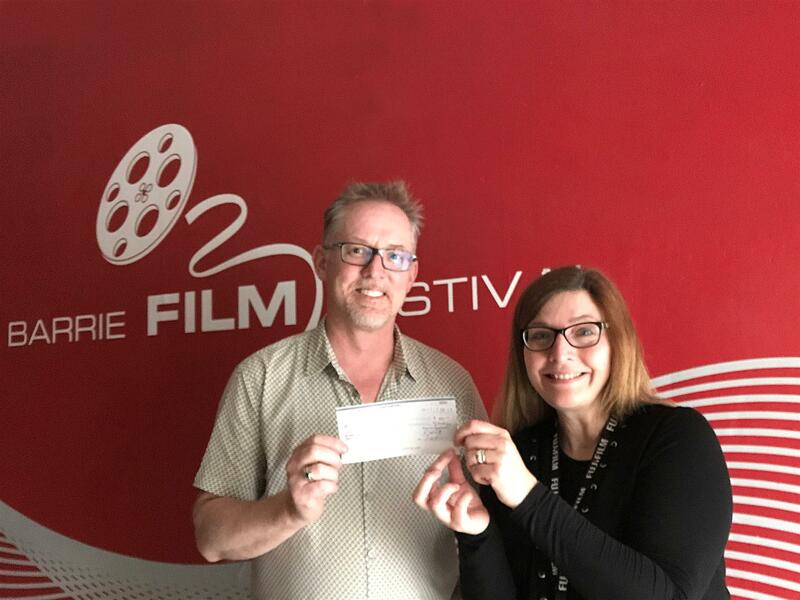 Michael Smiley from the Kempenfelt Rotary Club presenting a cheque for $1,000 to Claudine Benoit for the Barrie Film Festival's 2017 Education Program. The program will benefit Elementary and Secondary school students throughout Simcoe County as well as aspiring students from the Georgian College Digital Video Program. 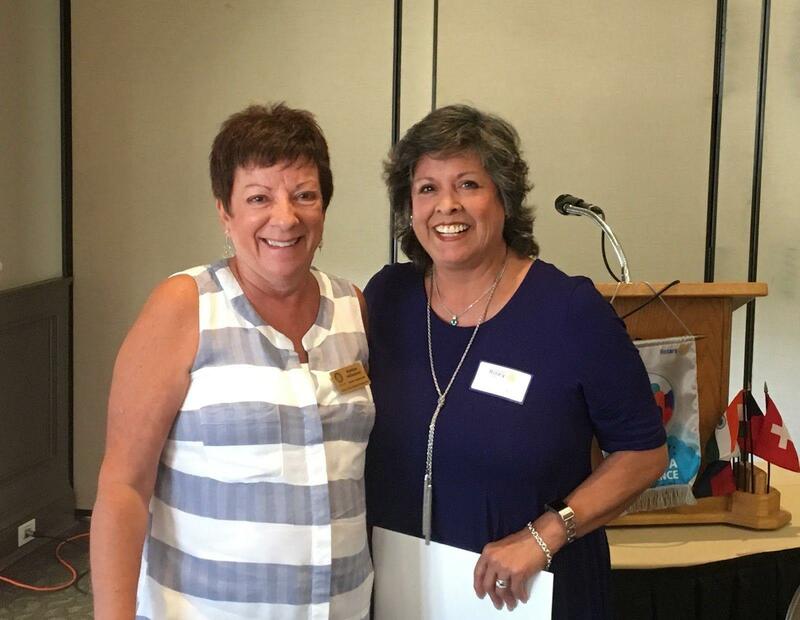 Dr. Cynthia Wesley-Esquimaux is the former VP at Lakehead University (Right) and Monique Vaillancourt President this year of Kempenfelt Rotary. Effective September 16th she is serving as the 1st indigenous Chair on the Truth and Reconciliation on behalf of Lakehead University, Thunder Bay and Orillia. She also serves as an adjunct asst Prof for the Faculty of Anthropology and Research and Affiliate of the Centre for Health Care Ethics. She is a Board Member for Healthy Minds Canada and the newly formed Teach for Canada Non Profit. She is a member of the Governing Circle of the National Truth and Reconciliation at the University of Manitoba and inducted as a “Honorary Witness” by the Truth and Reconciliation Commission of Canada. Cynthia outlined the issues and challenges that the indigenous communities are still having across Canada which are very concerning and they need more awareness so things can change. Change is happening slowly but not fast enough and they need Rotarians as well as Canadians in general to learn more and help wherever possible. In 2006 the 3 clubs commitment $1,250,000 to the campaign to build a Cancer Centre. $200,000 of that was committed by our Kempenfelt Rotary Club. The Cancer Centre opened in 2012 and had 116,000 visits last year. The current Hearts and Minds Campaign began in 2015 and our Kempenfelt Rotary Club was the first to make a commitment of $100,000. By the time that commitment is complete our club will have contributed $300,000 to RVH. "Quite an accomplishment for a young club" Dave said. 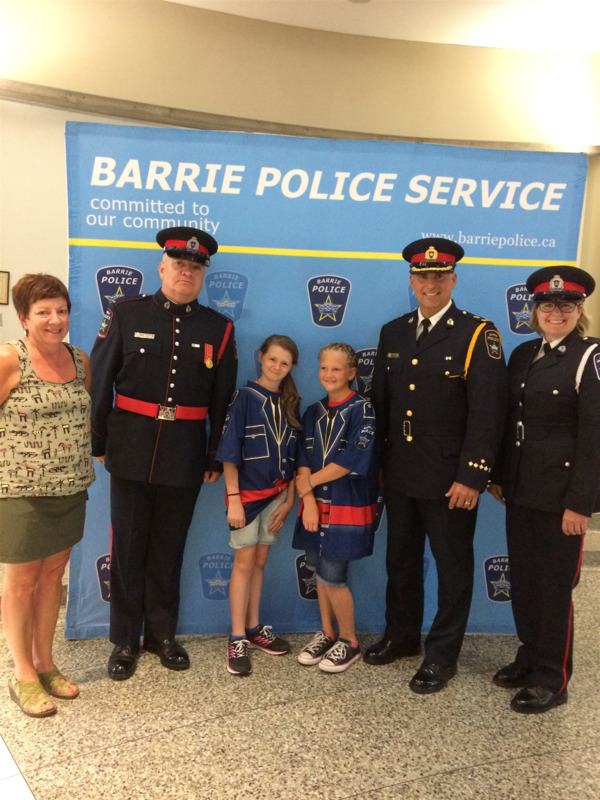 Monique Vaillancourt, Kempenfelt Rotary President attended 1 of 4 Barrie Police Junior Constable Camp graduations at City Hall on Friday July 21st. The Kempenfelt Rotary proudly sponsors the Camp to provide children with the opportunity to learn about a variety of safety procedures and have fun! Kempenfelt Rotary Follow Up From "Colt For The Day"
As follow up to our “Colt For The Day” event in February, Kempenfelt Rotary donated $5,000 to Big Brothers & Big Sisters as well as gave $1,000 to the Barrie Colt Foundation. Howie Campbell who is President of the Barrie Colts was our guest speaker on July 5th which was the same day as our cheque presentation and gave us more information about what the Barrie Colt Foundation does to help others. Welcome to the Kempenfelt Rotary homepage! If you are reading this, it’s either because you’re bored or you’ve run out of stuff to read online (highly unlikely) or, one of our Rotarians has spoken to you about our service club and you are looking us up. Hopefully the latter is the reason for this read. So here is the usual stuff. There are 4 Rotary groups in our area but Kempenfelt is known for how much fun we have! 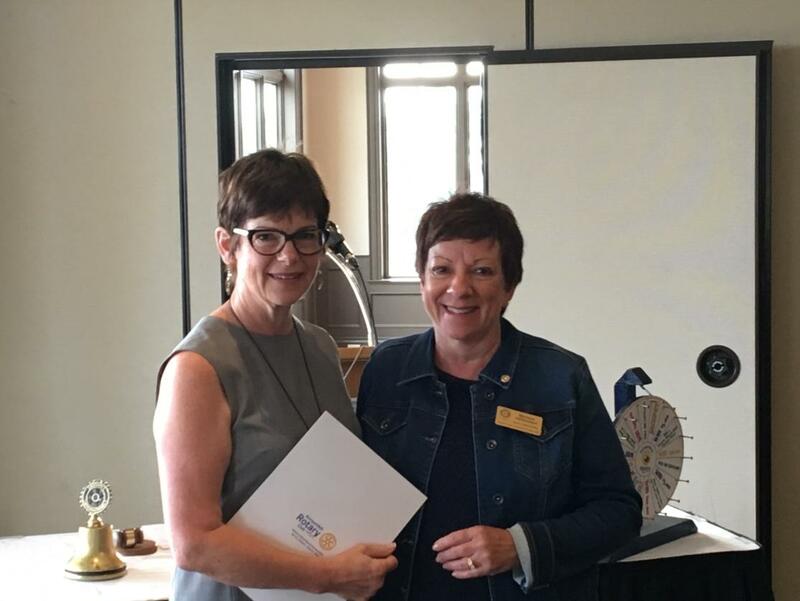 The Kempenfelt Rotary is a group of about 65 people who, yes, know how to have fun, but are dedicated to enhancing our community and making a difference in other people’s lives. We do this through our six major fundraisers, Taste the World, a food and wine experience is our largest fundraiser and Kids’ Fishing Day is a total give back to the community event. Every year, over 40 organizations receive funding through our events from large to small organizations including RVH, Georgian College, Hospice, Season’s Centre, Gilda’s, just to name a few. Our basic principles are based on truth and working for what is fair and beneficial to create good relationships. If you want to know more about this awesome service club please explore our website and calendar or, contact the Rotarian you met or email me directly. I would be glad to buy you a coffee and tell you all about what we do and who we are. 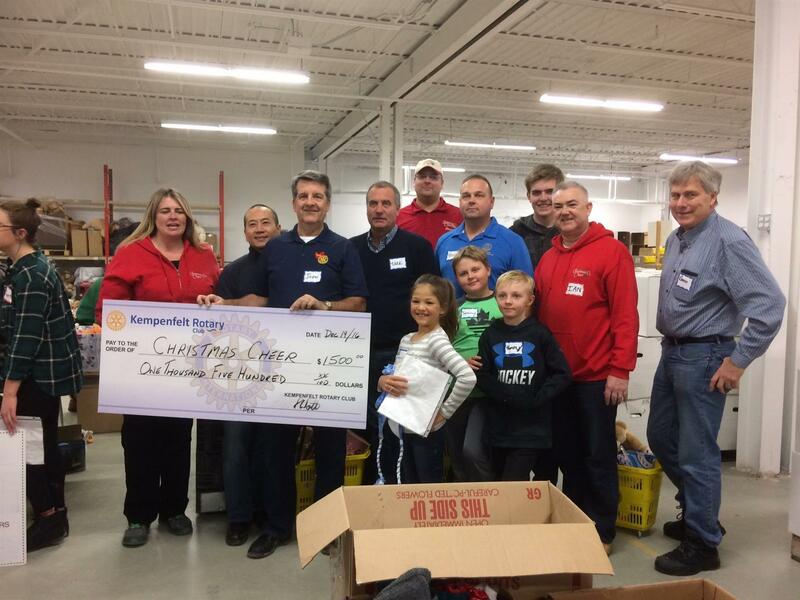 Last week when the Kempenfelt Rotary Club helped Christmas Cheer Barrie by sorting toys and donating money. It is sad to know that about 2000 receive from Christmas Cheer every year but this organization does a wonderful job of organizing everyone's donations and it provides community groups such as ours the opportunity to participate in some small way. The Kempenfelt Rotary also gave $1500 to Christmas Cheer this evening bringing them closer to their financial goal. About 30 Rotarians and family members put together over 50 children's gift bags this evening! Job well done! 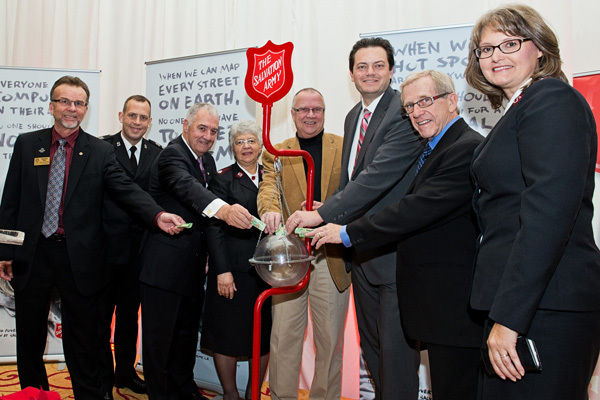 Salvation Army's Kettle Campaign Kick Off Breakfast - Look For The Kettles! 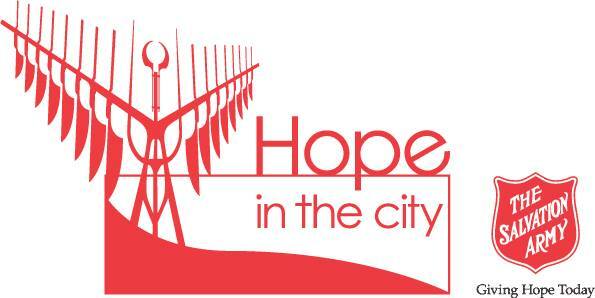 To those who joined us for the Hope in the City Breakfast on November 16th, thank you. What a wonderful morning we had, with much thanks to our incredible and inspirational speaker Major Danielle Strickland with the Salvation Army Barrie. Mayor Jeff Lehman was was there to support the "Kettle Campaign" fund raising kick off for 2016 called "Hope In The City". 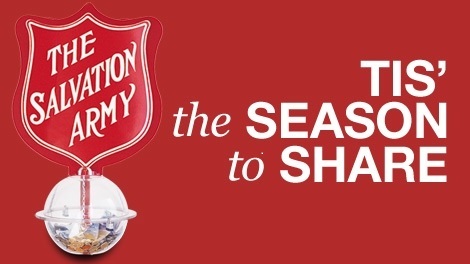 Please look for the Kettles and help the Salvation Army, to help others! 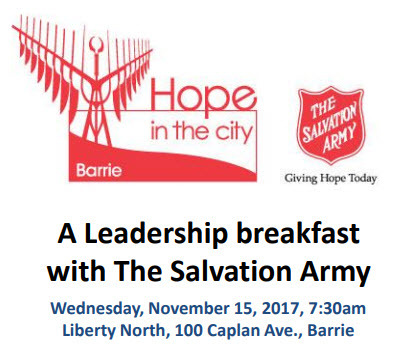 Hope in the City Leadership Breakfast with the Salvation Army -- annual fundraiser and launch of the Christmas Kettle Campaign -- is coming up on Wednesday November 16th. Please contact Jill Tibbenham by email or text as soon as possible to reserve your seat or table. Space is limited and tickets do sell out!! Danielle Strickland, a Salvation Army Officer, is passionate about caring for fragile communities around the world. This appetite for social justice has led her to back alleys and late night street corners to partner with Jesus in rescuing those struggling with drugs, homelessness, prostitution and despair. 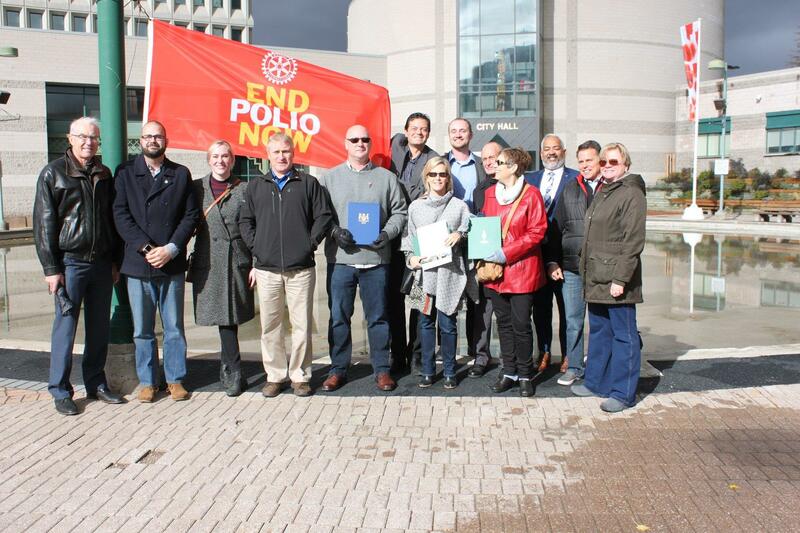 Thanks to everyone who came out on Monday October 24th which was World Polio Day for the End Polio Flag raising at the City of Barrie City Hall with Mayor Jeff Lehman! We are trying to do our part this year as we always do and are currently asking for donations to help with this important global cause. Polio is still only a plane ride away yet almost eradicated. We can't stop until it is eradicated. The Neema Children's Choir from Uganda, Africa paid a visit to the our Club this morning. The youth choir is raising money for the Neema Child Project, that provides Ugandan children with food, water, clothing, housing, health care and education - helping to build leaders who will lead their country out of poverty. For more information see neemachildproject.org Pictured are President Ross Watt and Pastor Daniel Mutibwa with members of the Uganda Children's Choir. 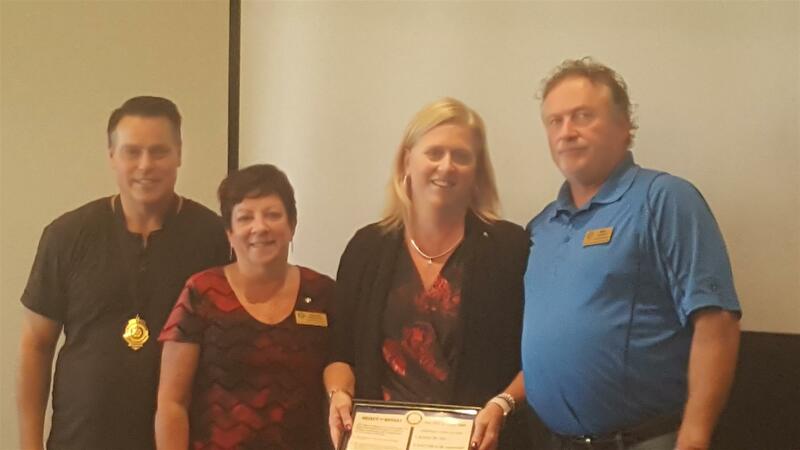 The three Rotary Clubs of Barrie decided to have a night each year to present awards to members of the community and the Rotary clubs that have gone above and beyond to help others. This picture is from our 1st annual awards night this year. 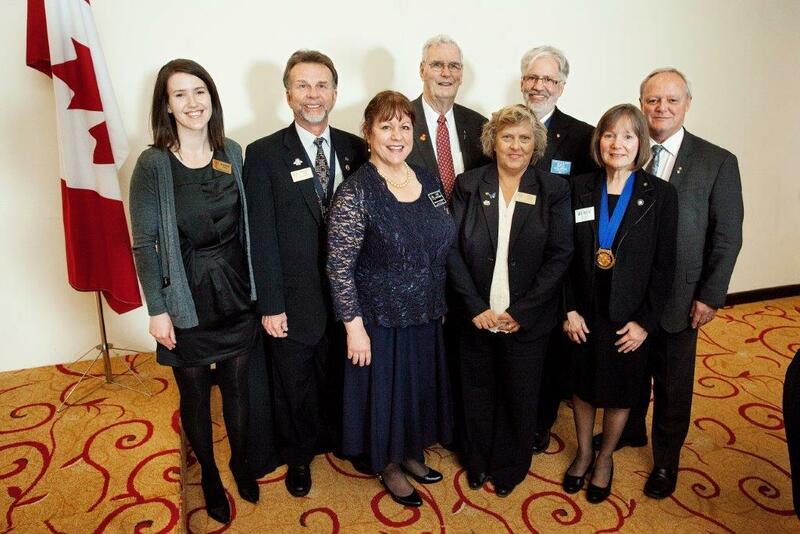 Pictured are: Rotaract President, Stephanie Dunn,; Kempenfelt Rotary President, Steven Gage; District Governor Lise Dutrisac, Vice President Innisfil Rotary, Barb Baguley; guest speaker Dr. Bob Scott; Barrie Rotary Club, President Bas Asselbergs; Wendy Miller, President Barrie-Huronia Rotary and RI Board of Director, Bryn Styles. New Path Foundation, on behalf of New Path Youth and Family Services, received a cheque in the amount of $1,000.00 today from the Rotary Club of Barrie-Kempenfelt. Funds donated will support events and activities occurring in Barrie during the 2016 Children’s Mental Health Week. Each year one week in May is designated as Children’s Mental Health Week across the Province of Ontario. This week provides local children’s mental health organizations such as New Path, along with their partners, the opportunity to highlight the work they are collectively doing in their communities. For 2016, Children’s Mental Health Awareness Week in Canada will be held May 2 – 8. 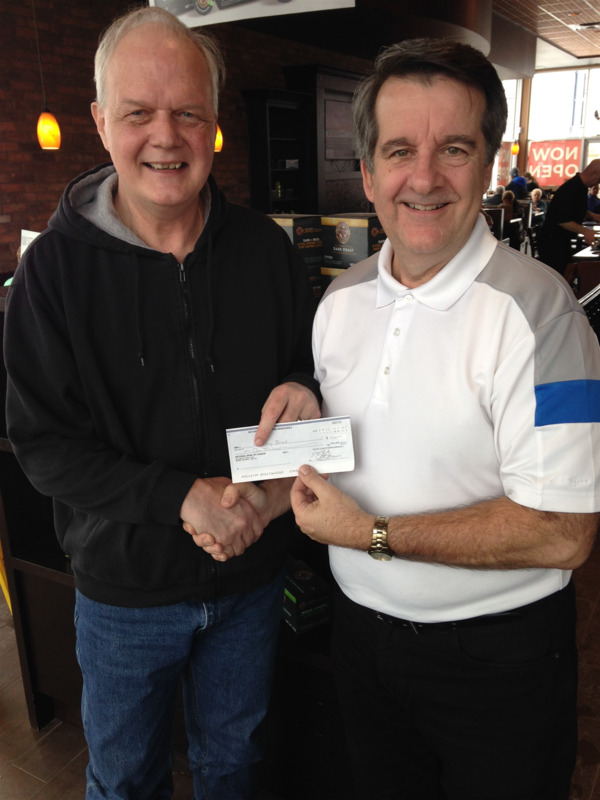 Pictured below are James Thomson from New Path and Steve Thompson from the Rotary Club of Barrie-Kempenfelt. 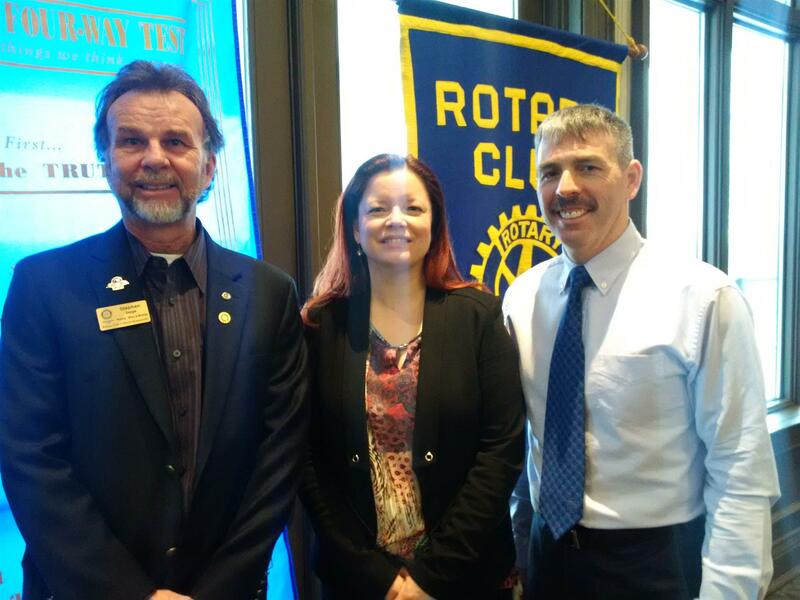 Kempenfelt Rotary was pleased to learn more about Team Broken Earth and their upcoming medical mission. Dr. Tina Whitty will be leading the first ever team from Central Ontario – Team Barrie. Dr. Whitty, an anesthesiologist, originates from Newfoundland and volunteered on a mission trip in October 2015 with several old friends and colleagues on Team Newfoundland. Within weeks of her return from Haiti, Tina was already planning to lead a team in the spring. Joining forces with her husband, military officer Major Ray Ryan, they have recruited a significant local medical team and will arrive in Port au Prince on May 7, 2016. Pictured are President Steve Gage, Dr. Tina Whitty and Major Ray Ryan. 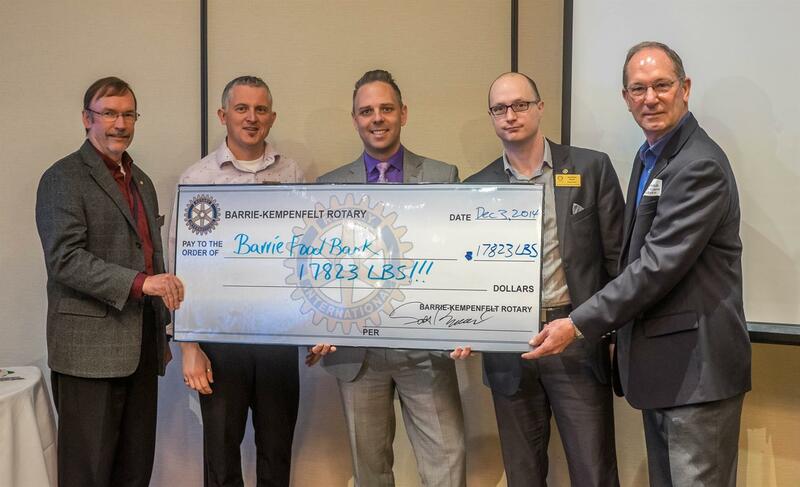 Nick L'Ecuyer, Kempenfelt Team Lead for our Food Drive Campaign, Peter Sundborg, Barrie Food Bank Executive Director and President Steve Gage were happy to unveil the final numbers for this year's food drive - an outstanding 11,143 pounds! Thank you to everyone that made this campaign a huge success! Battle Of The Bands - this Friday!! 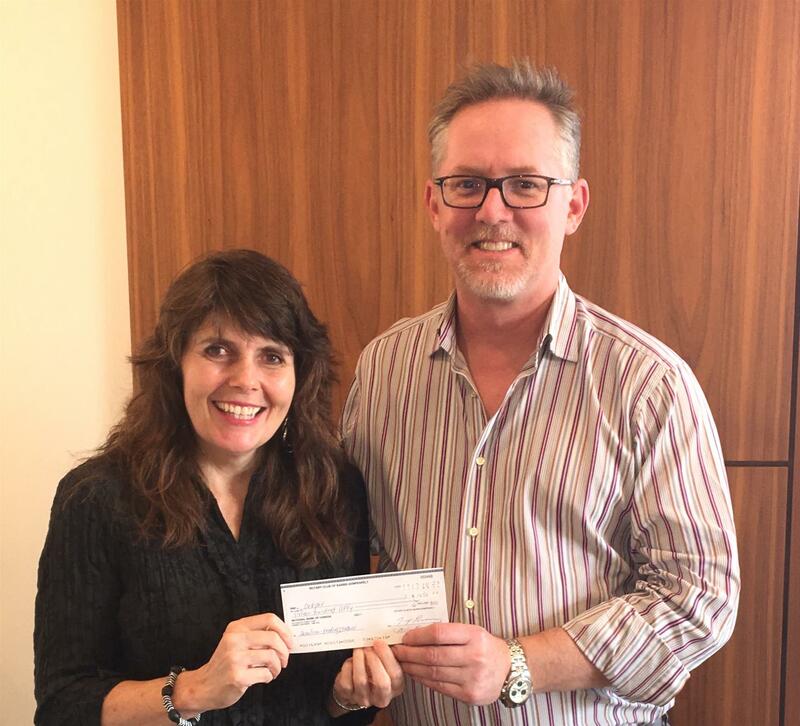 Steve Thompson, Community & International Director is proud to present Nancy Marcello of Robbie's Rainbow with a gift of $500 from Kempenfelt Rotary Club. The need for assistance is ongoing, please visit robbiesrainbow.ca to learn about how you can help them to continue to improve the lives of children living with Crohn's disease and Ulcerative Colitis. 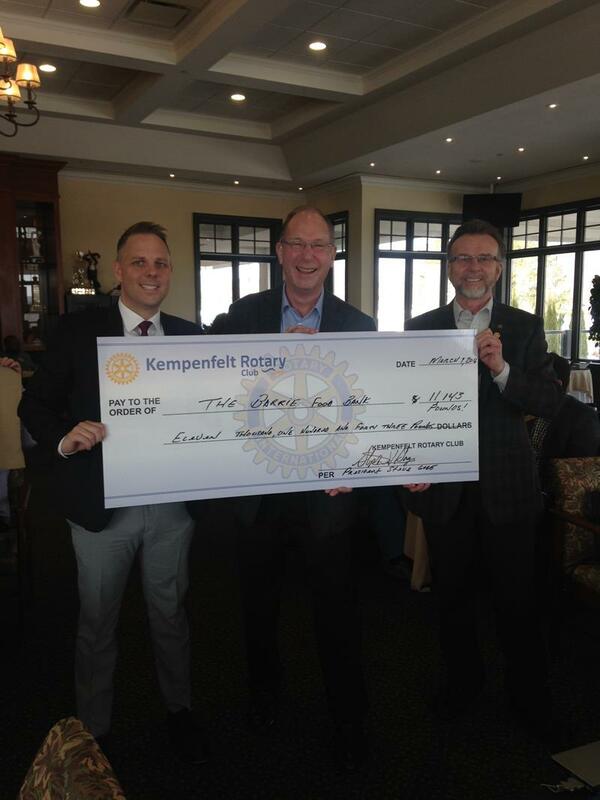 John Grinton is pleased to present a cheque on behalf of Kempenfelt Rotary in the amount of $1,000 to Frank Nelson and his Paying It Back campaign. Frank has been battling cancer for more than five years. During that time the doctors felt there was a possibility of a cure. They tell him that is no longer the case. Paying It Back is a group that helps Frank complete his bucket list of initiatives focused on helping others in need. 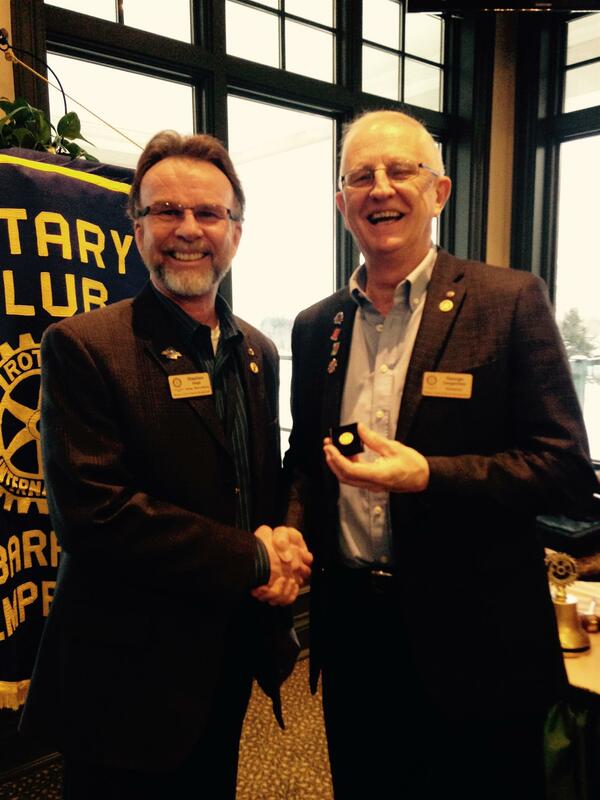 Thank you to Assistant District Governor 7010, George Dangerfield for presenting to the Kempenfelt Rotary Club Jan 20th! 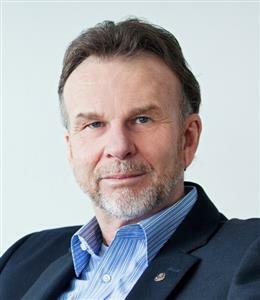 George Dangerfield has been a valuable Rotarian, a Charter member of the Huronia and Kempenfelt Clubs, Past President, and Assistant District Governor. 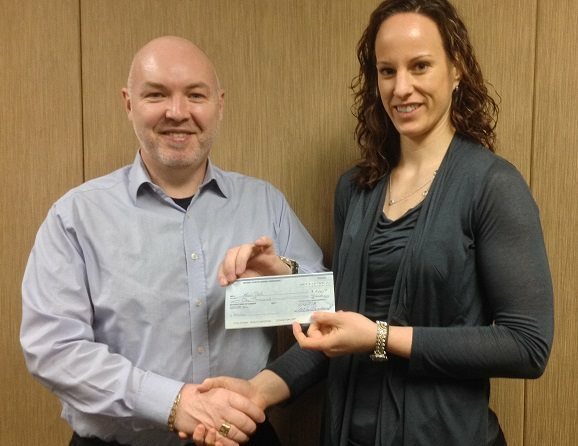 George was instrumental in the Kempenfelt Rotary Club’s participation in foundation donations. Since 1999 Kempenfelt Rotary has had 100% participation among members in donating to the Rotary Foundation. Steve Gage presented George with a Paul Harris award, George’s 5th. Congratulations George! Pictured are President Steve Gage presenting George with his Award. 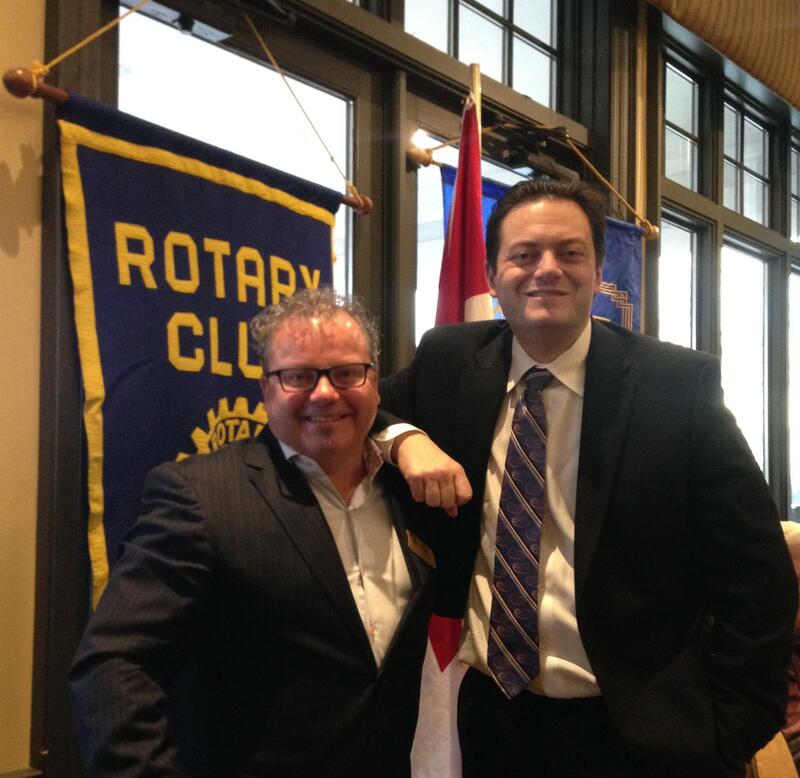 Kempenfelt Rotary was fortunate to have Mayor Jeff Lehman join us this morning to provide members with a look back on 2015 and share some of the exciting things happening within the City of Barrie for 2016. 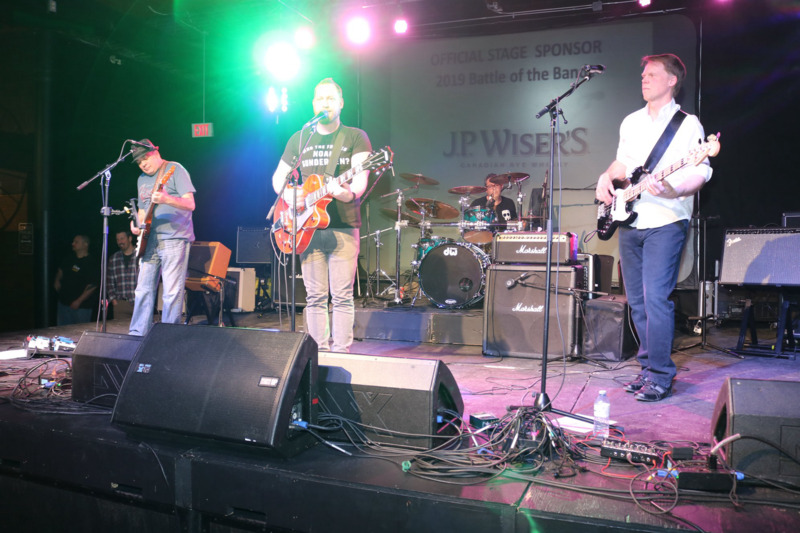 Pictured are Rotarian Gerry Pilon and Mayor Jeff Lehman – these gentlemen are also band mates in Sonic Coalition – updates to follow about this year’s Battle of the Bands – mark your calendars for Friday, February 26th and please note the change in venue to The Ranch! 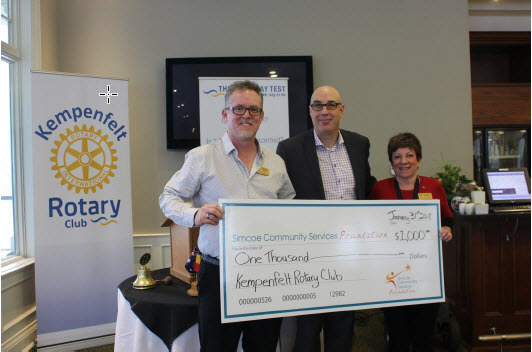 BARRIE, ON (Tuesday, January 19, 2016) – The Kempenfelt Rotary Club is proud to announce that it is taking another step in support of youth in our community. The Club has just learned that it was successful in its application to sponsor a senior high school student from the Barrie area to participate in the 2016 Rotary Adventure in Citizenship Program, May 1 to May 4, 2016 in Ottawa. The Rotary Adventure in Citizenship Program, now in its 66th year, is an annual event that provides a unique opportunity for a select group of talented young Canadians to come together and gain a better understanding of our country. Through meetings with political leaders, senior officials and others, students learn about the workings of our democratic institutions. The selected student will meet 199 other students sponsored by Rotary Clubs in all ten provinces and three territories, and their travel costs are borne by the sponsoring clubs. High school students between sixteen and eighteen years of age with above-average marks will be selected based on an application which is reviewed by a panel consisting usually of teachers and Rotarians. The deadline for application is February 15, 2016. 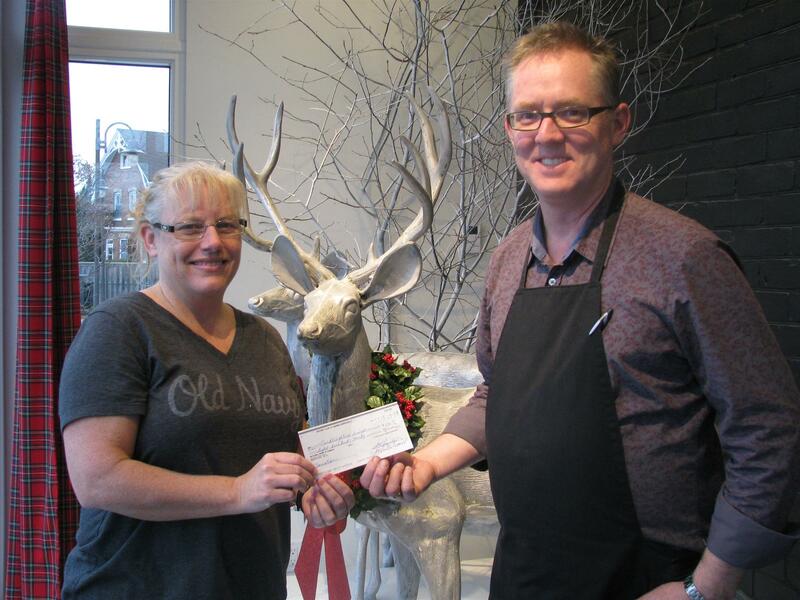 Proceeds from a recent Kempenfelt Rotary fundraiser were directed to Candlelighters Simcoe. Their mission is to empower families on their childhood cancer journey lighting the way by providing hope, support and education. To learn more about this organization and how you can help, please visit candlelighterssimcoe. 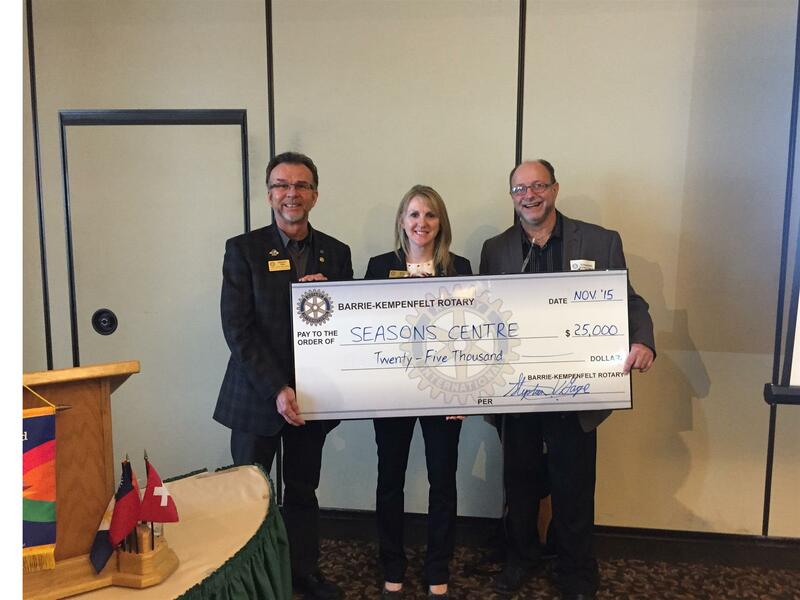 Presenting the cheque to Cheryl Gotthelf, Resource Development is Rotarian, Michael Smiley. Past President, Scott Brumwell with Georgian College student Elizabeth Jarniki this year’s recipient of the Kempenfelt Rotary Club Award. Kempenfelt Rotary President Steve Gage recently presented Seasons Centre for Grieving Children with a gift of $25,000. This gift will allow the Centre to continue to provide no cost, peer to peer support groups for caregivers and children ages 5 - 24 grieving the death, or life threatening illness of an immediate family member. With more than $900,000 in their pockets to kick-start the dig through their recent Hummingbird Campaign, a new parking lot will help alleviate the need for visitors to park on the busy Penetanguishene Road, as well allow ambulances and other service vehicles ample parking room. Kempenfelt Rotary was pleased to support this campaign and help them reach their goal! Hospice Simcoe has provided end-of-life services to approximately 1,250 Simcoe County residents during the past six years. The money raised by the campaign was used to purchase the nearby land to build the second lot, handle storm water works for the property and add a new garden next year. Please visit www.hospicesimcoe.ca to learn more about this organization. Campaign co-chairs from left are, Kevin Harradine, Lisa Whalen, Marta Duivenvoorden and Scott Harradine and Kempenfelt Rotary President, Steve Gage. President Steve Gage enjoyed breakfast this week at Liberty North celebrating the Salvation Army’s “Hope In the City Breakfast”. This is the organization’s annual event for the kettle campaign kick off! 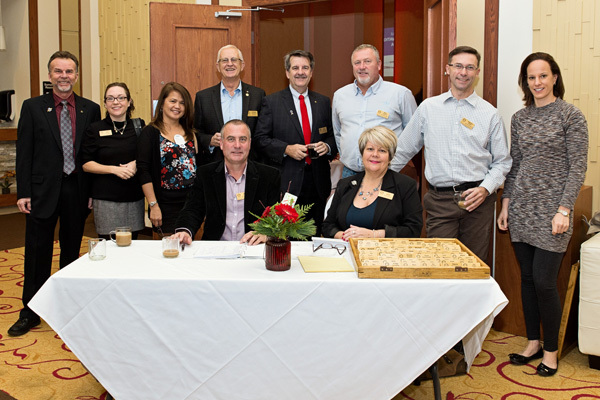 Pictured above are: President Steve Gage, Kempenfelt Rotary; Andrew Burditt, Divisional Secretary; Major Sandi Foster, Executive Director of the Bayside Mission; Guest Speaker, Peter Legge; Simcoe County Warden, Gerry Marshall, Mayor Jeff Lehman; Advisory Board Chair, Ted Handy and Captain Deana Zelinsky. October is Polio Awareness month globally. 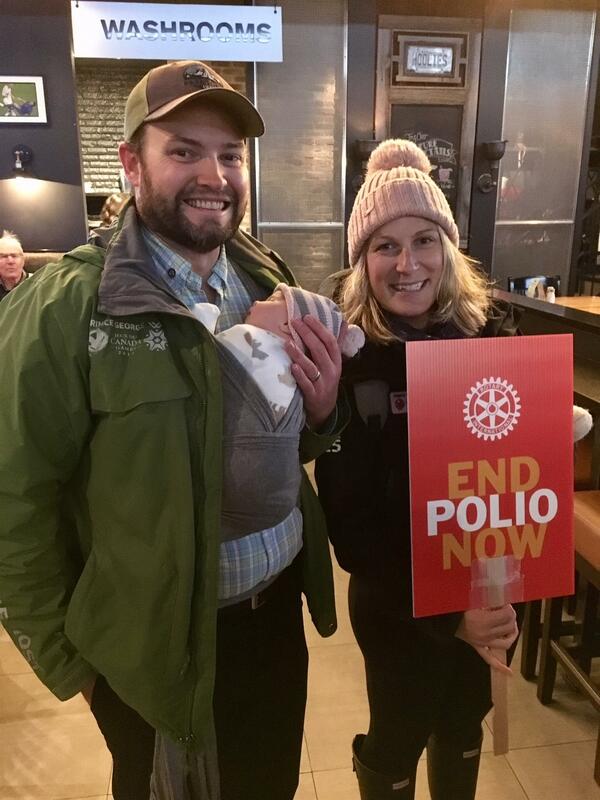 Rotary International along with the local clubs raise approximately $35 million every year to help eradicate Polio by giving much needed vaccine to countries still afflicted with this debilitating disease. It has been eradicated from all but two countries. Bill Gates has also pledged to double the donations raised by Rotary International up to $35 million which makes his donation approximately $70 million every year until 2018. If you would like to help us raise our share of the pledge locally, we have a website PocketChangeForPolio.com where you can donate online. We also list locations were our "Pocket Change for Polio" jars are so you can empty your pockets once to help vaccinate people in the countries still effected. We will be running our campaign until November 14th. 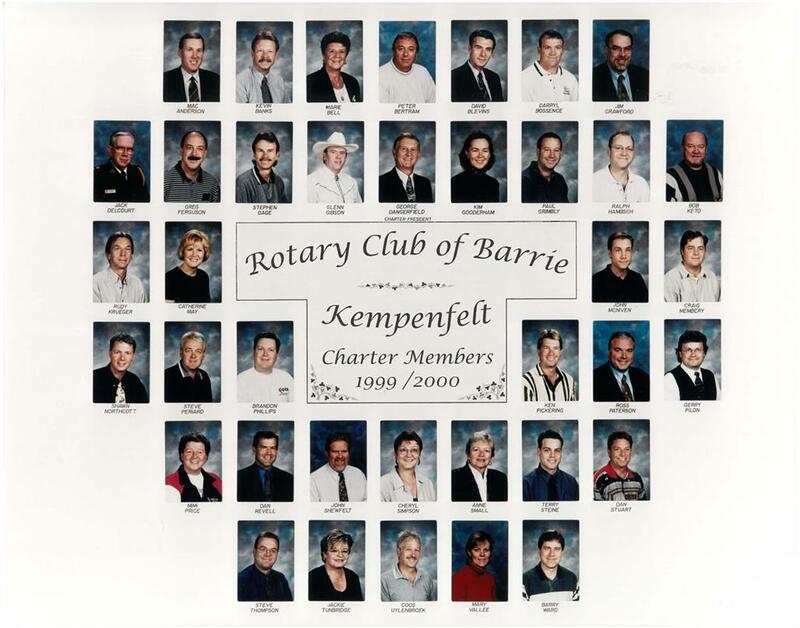 The Kempenfelt Rotary Club, chartered in 1999, is one of the best service clubs in Barrie and has now grown to over 60 members. The hard work and commitment of our members has helped the lives of many in our local community and around the world. Much of this success is attributed to the amazing leaders who have served before me and have set the high standard of Rotary’s motto, “Service Above Self”. The mission of Rotary International, a worldwide association of Rotary clubs with over 1.2 million members, is to provide service to others, to promote high ethical standards, and to advance world understanding, goodwill, and peace through its fellowship of business, professional, and community leaders. This year Rotary International’s theme is “Be a Gift to the World”. effort; we can give our dedication and our devotion. It is an honour for me to be given the opportunity to be this year’s President of the Kempenfelt Rotary Club. I look forward to working with our members to continue our service of doing good things for others and being a gift to the world. Are you a leader in our local business community? Do you want to give back to your community and make the world a better place? Then why not join Rotary, the largest service organization in the world. Rotarians always combine fun and fellowship in everything we do, and the satisfaction of helping others is the best reward of all. Sound interesting? It is! Let's get together and talk. Kempenfelt Rotary stepping up once again in support of our upcoming Children's Mental Health Week activities scheduled for May 7th. Pictured is James Thomson from New Path receiving a cheque for $1,000 hand delivered by Nicole Anstett from Kempenfelt Rotary. Please help the 1 in 5 that need your suppport!! 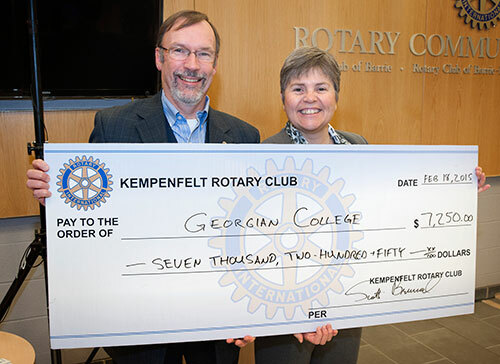 Kempenfelt Rotary donates $7,250 as an on going pledge to help raise money for the Georgian College health care studies. Thank you Georgian College for the tour of the new Health & Wellness Centre Feb 18. We are proud to have our club name on the wall on the Rotary Community Clinic with the other Barrie clubs. From the left: President Scott Brumwell, Kirk Evans, Nick L'Ecuyer, Jon Doyle and Peter Sundborg of the Barrie Food Bank. Delivering our donation after the results of our Food Bank Challenge. Thanks to everyone that contributed their time, money and food to make this challenge a great success! 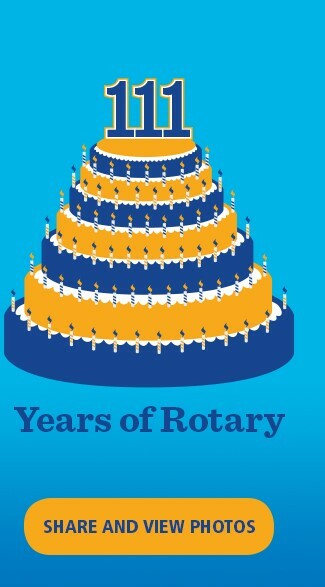 The Barrie Kempenfelt Rotary was pleased to celebrate a successful 15 years since inception August 4th 1999. This picture is of all the original charter members. On June 17th of this year the community of Angus experienced a devastating tornado which caused serious damage to approximately 100 homes. Hundreds of people were left homeless and they now struggle to rebuilt their lives and their homes. The Township of Essa setup a relief fund for people who wanted to donate to help assist the residents financially. 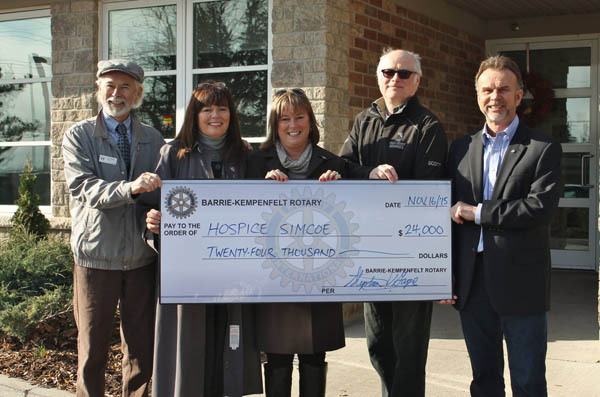 The Barrie Kempenfelt Rotary Club jumped in right away and donated $3,000 from proceeds of our various fund raisers. 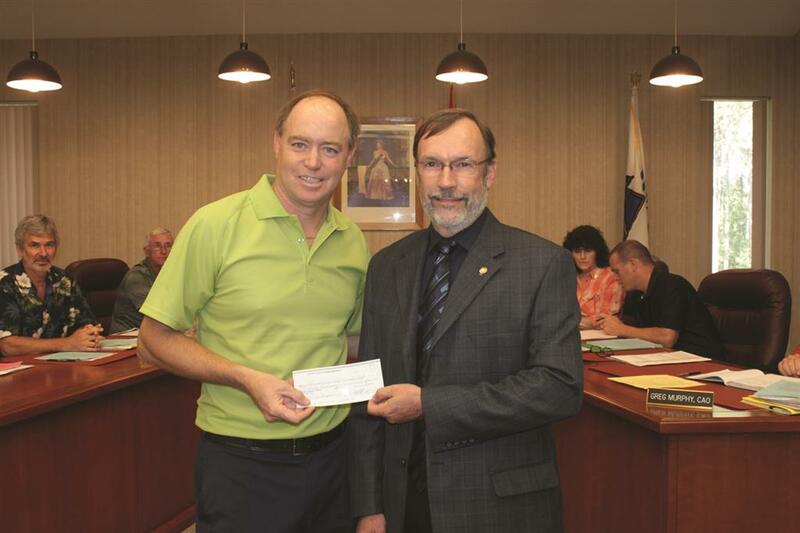 In this picture you can see Kempenfelt Rotary Club President Scott Brumwell handing over the $3,000 cheque to Mayor Terry Dowdall at the July 9th council meeting. This is just another example of how your contributions to our events and fund raisers is given back to help others in need. If you would like to assist with the relief fund, click here to go to their website for more details.